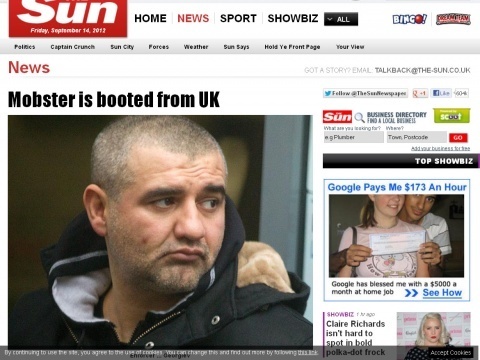 Bulgarian mobster, Tihomir Georgiev, who was nabbed by The Sun in London at the beginning of the 2012, has been booted back to his home country despite his fierce opposition. Georgiev, 43, notorious for slicing off victims' fingers and ears, has been extradited back to his homeland to serve 18 years' jail for murder, the press center of Bulgaria's Interior Minister reported Saturday. In September 2012, the man, known as "Tisho the Boxer" and "Butcher of Bulgaria" because of his brutality, had pleaded to stay in the UK under the Human Rights Act, saying he will be tortured in his home country. He claimed he would not get a fair trial in Bulgaria, where prisons are "degrading" and police will treat him badly while in custody. But District Judge Daphne Wickham ruled at London's Westminster Magistrates Court that he could be extradited. In April 2012, Georgiev told Westminster magistrates court that he was tortured by authorities in Bulgaria which, he said, are "corrupt at the highest level". The 44-year-old gangster was arrested in January 2012 after The Sun traced him to a boxing gym in Bermondsey, South London. He fled to the UK in the summer of 2011 after being sentenced to 15 years in Bulgaria for stabbing to death a gang rival. The brute is also being probed over the sickening torture killings of a drug dealer, the supplier's girlfriend and a journalist. Two of the murders he is being linked to by cops are those of drugs supplier Emil Kushev, 30, and his lover Billiana Naumova. Both were beaten, tortured with scissors and shot for failing to pay debts in Bulgaria in 2007. The third victim is said to be journalist Boris Tsankov, who was later shot dead in the capital, Sofia, after blaming Georgiev. Georgiev is believed to be a former associate of "Zlatomir Ivanov (aka Zlatko Baretata - The Beret, The Barret), a ruthless Bulgarian mafia boss who controlled a vast empire based on drug-dealing, prostitution and money-laundering. In Bulgaria, Ivanov was sentenced in February 2012 to eight years behind bars in what is considered to be one of the most emblematic and high-profile organized crime cases here.